Deciding to build or renovate a residence is the easy part, and, in a way, so is the construction or renovation. The difficult part lies primarily in the middle of those two steps – obtaining construction permits. As anyone who dealt with any government office, interaction with a government entity can be frustrating. Regardless, to ensure that buildings are constructed or renovated according to the building code, a procedure exists that specifies a construction project cannot begin until a permit has been granted. In many cases, it is incumbent upon the contractor to obtain the necessary permits from the proper governmental authority. And, usually, the construction contract provides for this. 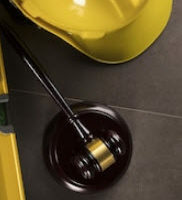 Nevertheless, engaging the service of an experienced construction contract attorney can be critical to ensuring that this vitally important step is completed. An example of the consequences for failure to obtain permits is currently playing out in Hillsborough County, where a farm stand has been cited – and is continuing to be cited on a daily basis – for failure to obtain the necessary construction permits. Right now, the matter is being fought in court, where the farm stand is asserting that the construction is agricultural in nature, and exempted from the permitting process governed by State law. A discussion of permits, including when they are and are not required, will follow below. All buildings in Florida must be built according to a specific set of guidelines, parameters and the like, which is set forth in the Florida Building Code. Given the prevalence of hurricanes and tornadoes in Florida, the Code, for example, provides guidelines regarding how much wind a building must be able to withstand. Other guidelines include ensuring that electrical lines are a safe distance from water pipes, that sewage pipes are safely placed so as not to cause sickness, and that gas lines are properly sealed to withstand natural events. To ensure that all buildings are built, or renovated, in accordance with the Code, most jurisdictions have established a process a contractor must follow to obtain a permit before beginning construction. It is in this process that the government agency will review the proposed construction or renovation and determine whether it meets the requirements set forth in the Code. If it does, a permit will be granted and construction may begin. If not, the contractor and property owner must submit a more compliant set of blueprints. Further, the agency will periodically send out building inspectors to ensure that the property is being built according to the approved blueprints. This list is not exhaustive, and it is best to obtain the services of an experienced construction law attorney to definitively advise as to when a permit is required, as well as when it is not. If you entered into a contract with a construction company to build or improve your residence, it is imperative that the construction contract be explicitly clear who is to obtain the necessary permits. To ensure that this is the case, contact an attorney experienced in construction law as soon as possible. The attorneys at Linkhorst & Hockin, P.A. have years of experience in drafting and negotiating ironclad and clearly-understood construction contracts. We can do the same for you, to ensure that your construction or improvement is not delayed as a result of a failure to obtain the necessary permits. Contact our Jupiter office today.